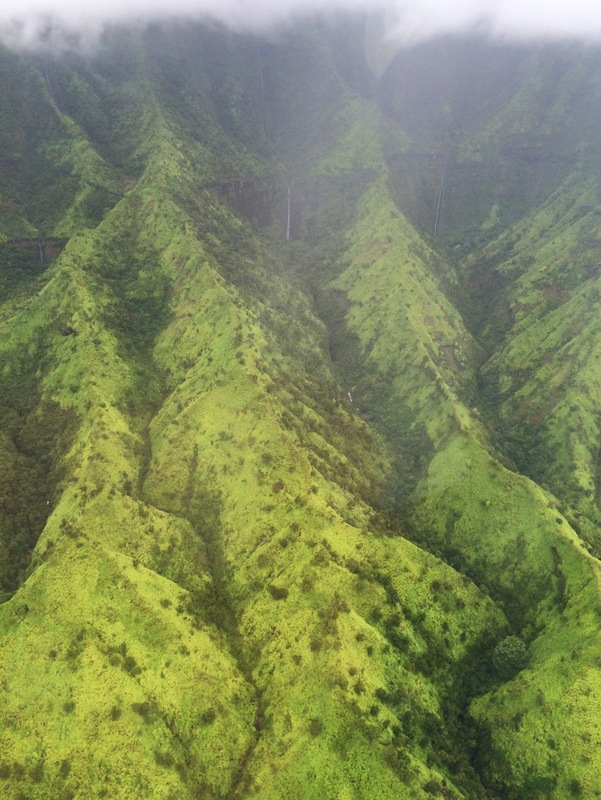 We left Sacramento early this morning and flew to Honolulu, then onward to Lihue airport on Kauai. Hawaiian Airlines coach seats are definitely more spacious than most other airlines, which was a nice surprise. Also, they actually served a warm breakfast (a small but reasonably tasty breakfast sandwich), later followed by a snack of Maui sweet onion potato chips, which happen to be a childhood favorite for me. 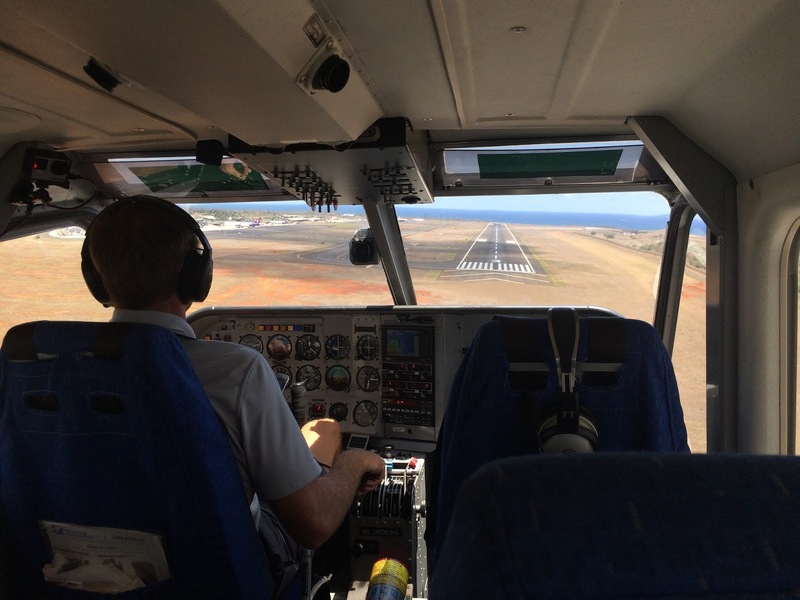 Lihue airport is rather adorable, and it's hard to believe that large jets coming directly from the West Coast can actually land there. We had our checked bag and rental car keys in hand about half an hour after arrival, and quickly set off on Highway 50 north toward Kapa'a. We ate our first local lunch of ahi tuna poke (delicious) and tako/octopus poke at Pono Market, then picked up sunscreen and hats at ABC Store (a local chain that is super convenient), groceries at Safeway. Check-in at our condo, Wailua Bay View, consisted of filling out a little card saying "we're here," thus alerting the complex manager to leave a parking permit on our door. For our first evening in Kauai we got fish tacos at Tiki Tacos, which were quite good, with a housemade thick corn taco that held up well to the very juicy fish and copious toppings. That said, it's admittedly hard to be impressed with Mexican food when one lives in LA. I got a much-needed and excellent haircut with Kimberly (her one-woman salon is called Shear Neveah), and then we picked up some more groceries at Foodland. The three-hour time difference put us to bed quite easily. 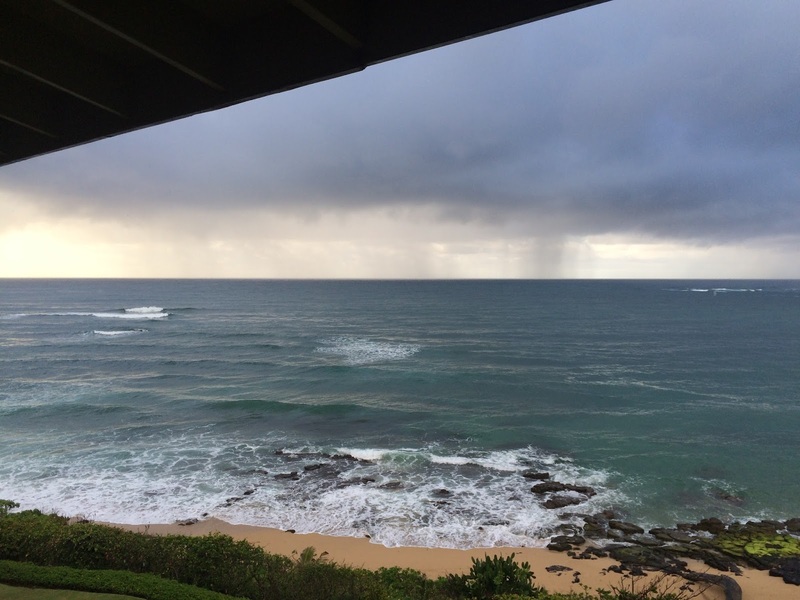 We woke up early enough to watch the sunrise from our lanai. It was slightly underwhelming today in that the morning was cloudy, but still turned out to be interesting because we saw several dramatic microclimates within a single hour: rainbows over the island, patches of blue sky above us, and contrasting patches of stormy rain over the ocean in the east. 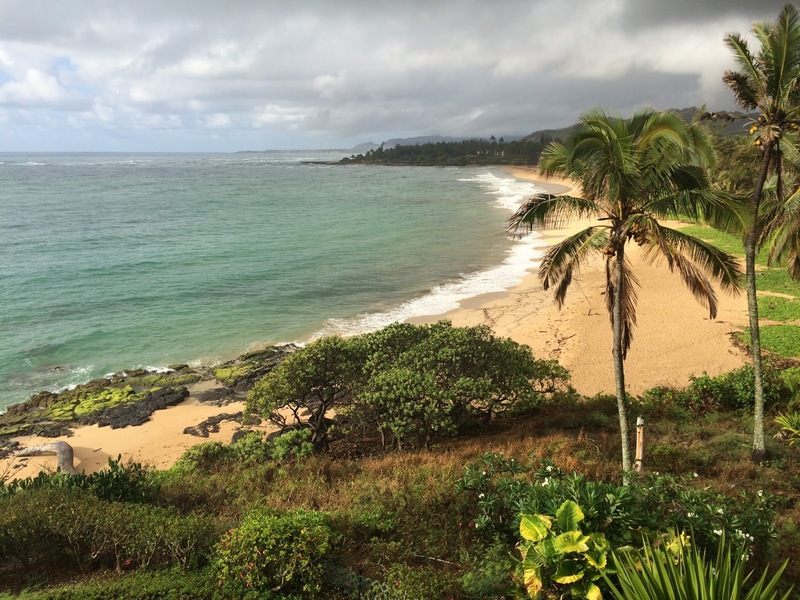 Around 9:30 we drove south to Kauai Coffee Company in Kalaheo. 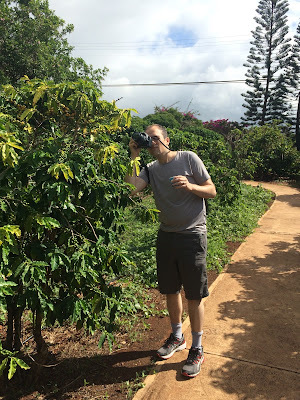 It's the biggest coffee plantation in the United States and quite stunning, with the massive coffee fields extending toward the ocean on one side and running up against the mountain landscape on the other side. There is an easy and educational self-guided walking tour and a tasting patio, with about 20 coffees available for [free] tasting. For a coffee addict like Andrew and a growing coffee aficionado like myself, this was quite fun. Shipping bags of beans to the mainland was also reasonable, so we did some of that and brought a couple more bags home with us. 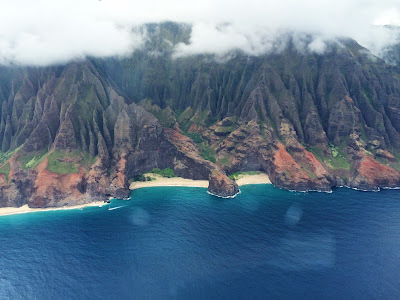 Our next destination was Lihue Airport for an airplane tour of the island. We had booked with Wings Over Kauai and were pleasantly surprised to learn that we would be the only passengers on our tour (their primary tour plane, the AirVan, seats six). Our captain, Josh, was both professional and friendly, and provided us with a beautiful ride and informative narration. It was particularly stunning to bank toward the Na Pali Coast and see it for the very first time, with its apparently endless cascades of verdant valleys contrasting with the jagged cliffs and the bright blue water below. Similarly memorable was the flight over the Hanalei Valley, with too many waterfalls to count. Lunch after our flight was at the Kalapaki Beach Hut in Lihue, where the burgers came recommended by Captain Josh and indeed did not disappoint. The fries were also great, sort of like McDonald's fries but better. 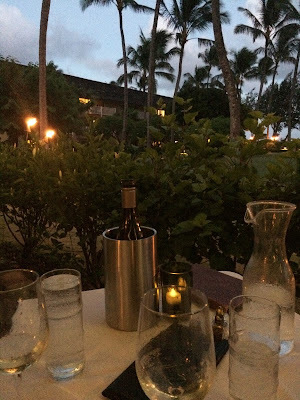 After a quiet afternoon at the condo, we drove the half-mile up the road for a "fancy" dinner at Hukilau Lanai, which had consistently great reviews on Yelp and turned out to be a solid choice for a romantic and scenic dinner. 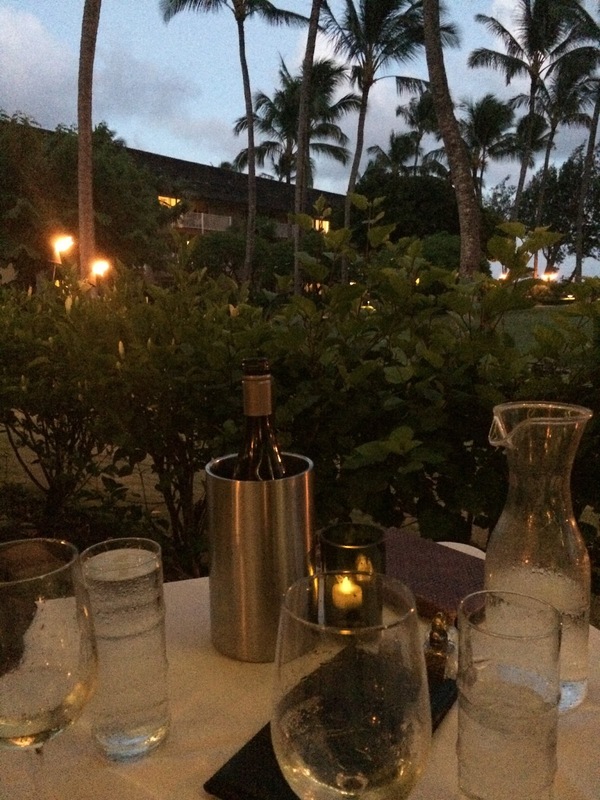 We were seated at one of the tables on the lawn level, which looks out at a lovely landscaped area and the ocean beyond. Service was friendly and suitably attentive throughout, and all our server's recommendations were spot-on. We felt warmly welcomed and quickly relaxed. There is a tasting menu available from 5:00-5:45pm that is an excellent deal (five courses for $32, or $50 with wine pairings), but we opted for entrees off the regular menu. 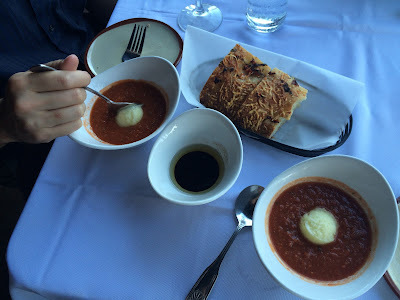 We started with the chilled tomato gazpacho with pineapple sorbet, which was delicious, along with warm focaccia. 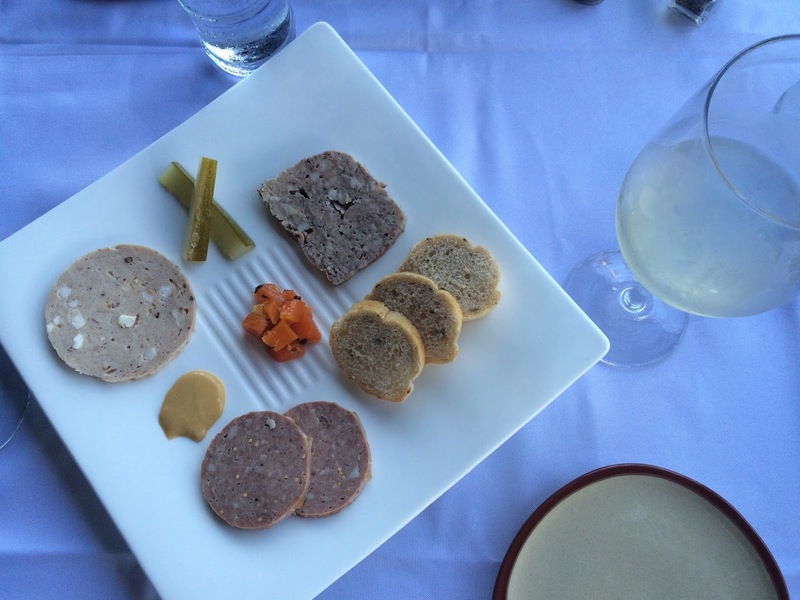 Next, the charcuterie plate of local pork pate, smoked sausage, and mortadella, served with toasted bread and pickles. 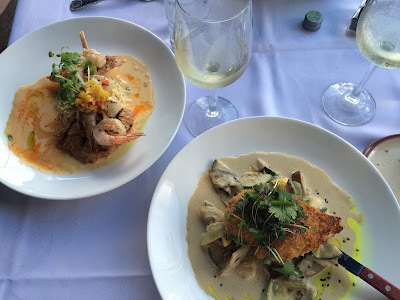 Our entrees were the Hukilau Mixed Grill (snapper, butterfish, and skewered shrimp on a bed of creamy rice and vegetables) and the macadamia nut chicken (with yellow curry and vegetables). Everything was excellently prepared and generously portioned, and in retrospect we definitely didn't need the appetizer(s). The flavors were generally familiar and even comforting, but the preparations were refined. To accompany, we shared a bottle of crisp Grenache off the "20 wines for 20-something" list (another pleasant surprise). Our dessert was the restaurant's signature warm chocolate cake with vanilla ice cream, and a small box with two dark chocolate truffles was set down alongside. By dessert, the sun had nearly set and the tiki torches were cheerfully lit.